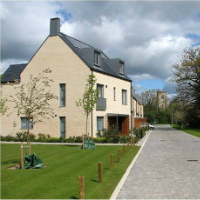 An exemplar housing scheme of 1,200 homes at Trumpington Meadows to the south of Cambridge in which Tetlow King Planning has been involved has come to fruition after more than five years planning. Tetlow King Planning were appointed by Trumpington Meadows Land Company Ltd., a joint venture between Grosvenor Properties and the University Superannuation Scheme (USS) Ltd. Assisting with negotiations of a separate agreement with the successful affordable housing provider, Cambridge Partnerships Ltd, fronted by Bedfordshire Pilgrims Housing Association (BPHA). Eventually £10 million was secured in grant from the HCA via delivery partner BPHA to secure the delivery of 40% affordable housing (480 homes). Through an innovative approach the HCA will release funding at higher levels in earlier phases of the project, easing the finance of the total scheme. Overage arrangements are in place between the HCA and BPHA to ensure that the HCA will have a share of any uplift in value of the shared ownership properties. © Image copyright John Sutton and licensed for reuse under this Creative Commons Licence.